Hello, My name is Julio Bara, I was born in El Salvador and the migrated to Australia when i was very young due to the civil war in El Salvador in the late 80s. Historically i competed in triathlons predominately at Olympic distance for 6 years. After this i focused on half marathon distance whilst working full time and completing my Masters. It was easier to train for one discipline than three. During this time I was also working at a cycling store, during this i became very passionate about riding and was able to compete competitively at a high level in Aus for a year. Unfortunately several accidents resulted in me to stop cycling and i lost motivation to train for any sport. Fast forward 4 years i am now living in London, and found Tribe and this has helped to motivate me to get back into running and training. The are several reasons why i have signed up to complete the whole run for love challenge. For me, as with Most of us, we remember when we were at our "best" - when physical limitations were more about "guts" than they were about strength, flexibility or stamina. I would take on any challenge offered up by my mates. I could stay up all night just for the fun of it. I tried new things because they looked fun and I would laughed at my training mates when they failed with heroic attempts. And all the while, never did a bruise, a scrape or even a broken bone determe from taking on the next challenge once it was brought to my attention. For me it feels like a life time ago. Somewhere in life I began to "play it safe". I stopped trying new things, taking on the dares from my mates and testing my physical acumen. I surrender to "watching the youngsters do it" or making excuses for it - like bad knees, an old running and cycling injury or "something else" I have to do at the time. If prompted or prodded in any way I would quickly change the subject and reflect back on the time I experienced the "runners high", "pedalling on clouds" , in an attempt to somehow I would say, "You know, I was able to go for it like that at one time in my life...even though you can't see it now." This challenges represents the opportunity for me to seek fulfillment in the joy of simply exploring Europe with friends- rather than trying to relive old, worn out stories. The challenge will allow me to see how far I can come and what i can endure and share those highs and lows with a special group of people. I am most afraid of realizing i am not resilient and unable to endure the physical challenge mentally. Of course the risk of injury is a concern, but the body heals quicker than the mind. Improving my physical well being is a strong motivator, however the opportunity to discover what i can mentally endure and continue despite being physically broken is a motivator and something unknown to me over a challenge such as this. Training for Run for Love has been difficult. Trying to train for both the run and ride has been harder than expected whilst working full time. I have predominately focused my training on running. I prefer to run solo but i changed my training and have surrounded myself with several tribe legends and friends to motivate during the long runs that i have been complete back to back on weekends. Over the last month, i have increased my cycling training to ensure I have some capability on the bike but it has been limited and will be my limiting factor for the challenge. Knowing that i recovered from injuries which have resulted in several surgeries in the past, gives me the strength to push my body further. Physical capabilities are made to be broken, if they sometimes result in injury, you take a step back and rebuild. I take alot of inspiration from my parents, knowing what they have done to give me and my brothers a better life, provides me with the drive to push on when things are getting tough. Over the last few years, and my girlfriend can testify i become grumpier when i do not run or cycle. I cannot imagine life without running or cycling. The freedom and the trance that I get in when running or riding is addictive. For me to stop running or riding regularly wouldn't benefit anyone, especially me. I am completing the whole challenge, because i love doing both. But i prefer cycling in Australia because the roads are more open and rolling hills and the weather is better. In London i prefer to run , because i have the ability run past so many amazing landmarks on a daily basis. Not in particular, but i upon completion i will be very thankful to my girlfriend for feeding me and putting up with me going out for long runs and going away for 2.5 weeks without her. 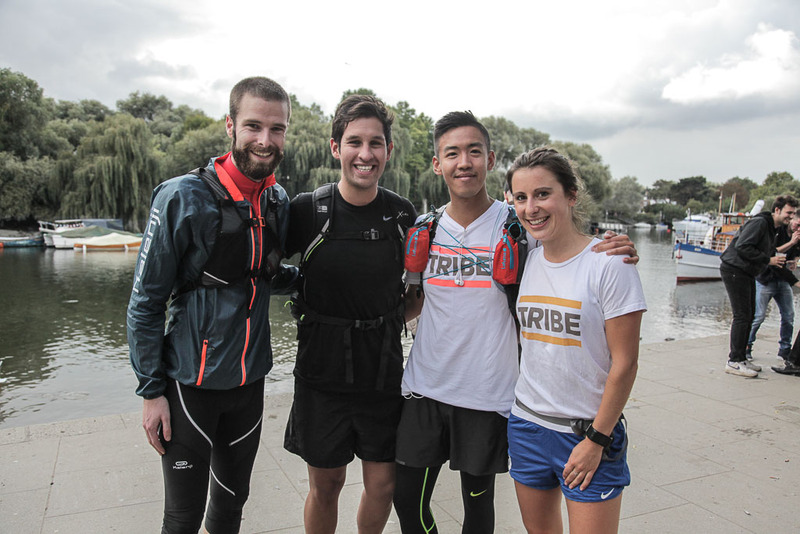 Furthermore thankful to the tribe team and tribe legends for doing the challenge alongside me. To many to list, but eating what i like (ice cream mainly), seeing the amazing landscape that Europe has to offer are what i am looking forward to. Also I will be looking forward to a shower everyday of the challenge and someone to rub my feet and legs.